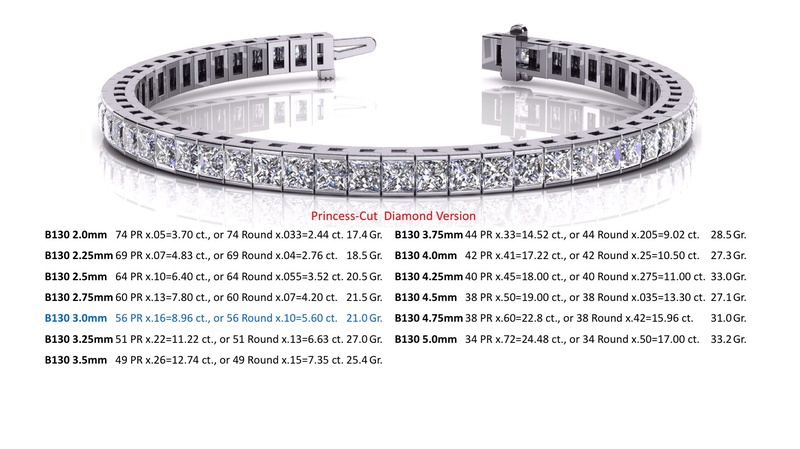 Classic Princess Cut Diamond Tennis Bracelet One of our most functional pieces – this bracelet can be made in your choice of 13 different sizes! Whether you choose white gold, yellow gold or platinum, the diamonds will shimmer in this piece effortlessly. Also, the total diamond weights range from 3.7 to just over 23 carats. The princess cut stones are channel set in ‘rectangular boxes’ which are seamlessly linked together. It sits perfectly on the wrist and features a very sturdy clasp. This is one of our most classic pieces, which is a timeless, stunning design.